Canopy acts as a sheltered play space and entrance covering structure. This steel box hoop playground canopy sits alongside an existing school building to create an entrance canopy, weather protected parent waiting area and outside play space. 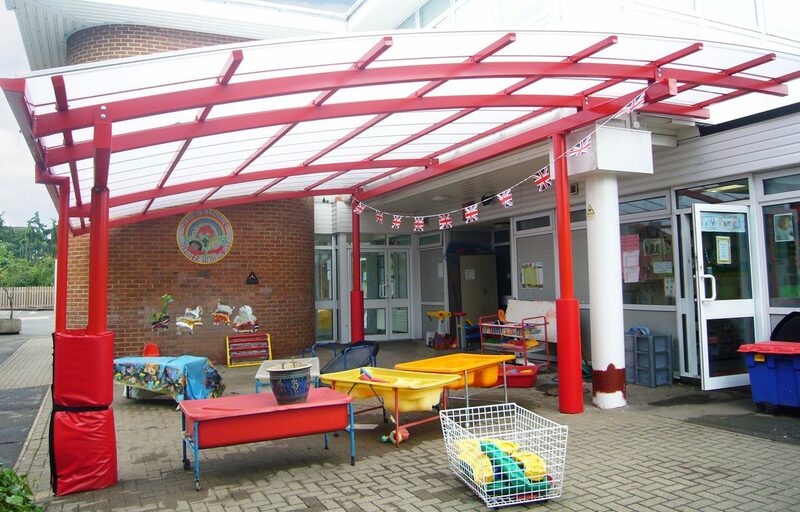 This canopy is an excellent example of the range of uses a Fordingbridge structure can provide your organisation with. The structure is finished in the schools colours and has a 25 year guarantee. All of our steel work is designed and manufactured by our in-house technical team, meaning precision in design and engineering and speed of manufacture for your convenience. Fordingbridge is a fully CE mark approved manufacturer of steel fabrications. Post protectors complete the structure for added protection. Roof: Hard-wearing translucent 16mm triple walled polycarbonate. This covering has a guarantee 15 years is fire retardant and gives high UV protection.